The October General membership Meeting of the Alvin Museum Society featured a program by James Glover who is a well known researcher on the descendants of the founding families of Brazoria County. According to Mr. Glover, the families, including the Thomas family, from which he is descended, have “intertwined throughout time and territory, “creating an interesting family story which he enjoys telling. 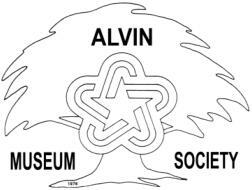 The October General membership Meeting of the Alvin Museum Society will feature a program by James Glover who is a well known researcher on the descendents of the founding families of Brazoria County. According to Mr. Glover, the families, including the Thomas family, from which he is descended, have “intertwined throughout time and territory, “creating an interesting family story which he enjoys telling. In keeping with its continuing work to collect information The Society is extending a special invitation to local residents who have a connection to early settlers to attend the meeting , at which group or individual photographs will be taken to add to the Society’s archives. In addition, participants can share old family photographs which will be scanned and added to the museum’s collection. Documentation on the photograph will be recorded, along with the image to be stored. For the enjoyment of the group some of the photographs currently in the collection will be shown in a film presentation. The meeting is 2:00p.m. Sunday, October 26, 2014, at the Alvin Senior Center. For more information call 218-33-4469 or email- alvinms@att.net.